I’m pretty sure I’ll never get the opportunity to walk the red carpet at some Hollywood blockbuster movie premiere. 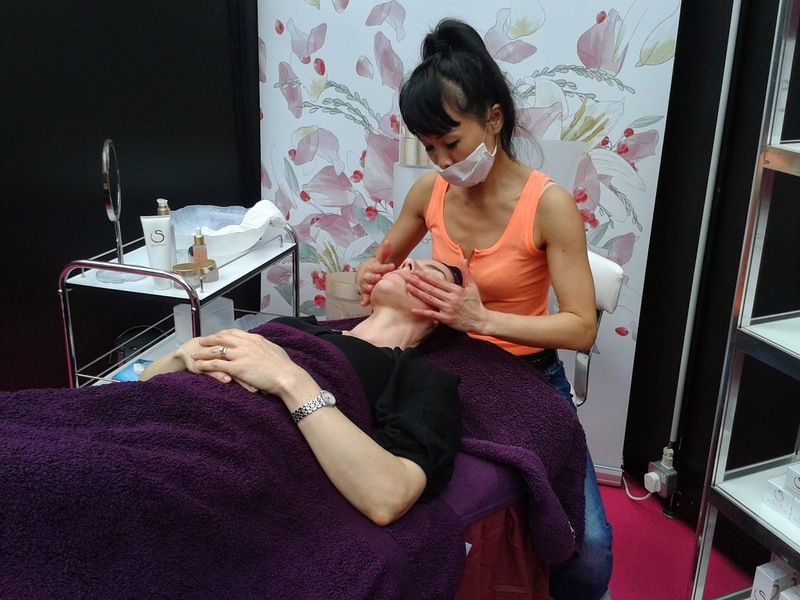 But who needs that when I can get the film star treatment at the Anti-Ageing Health & Beauty Show in London. 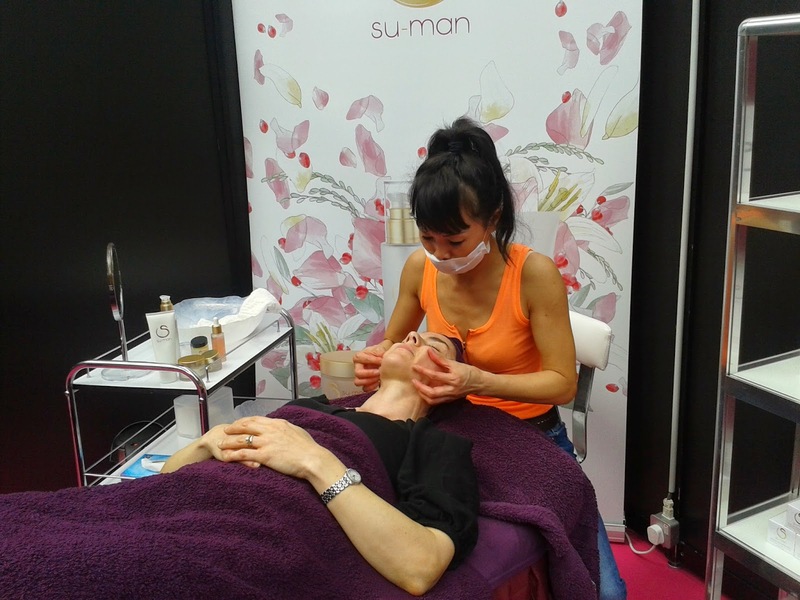 A few days before the start of last weekend’s event at Olympia, I was thrilled to receive an invitation to experience at first hand a mini facial with the celebrated Su-Man, who was exhibiting at the show. 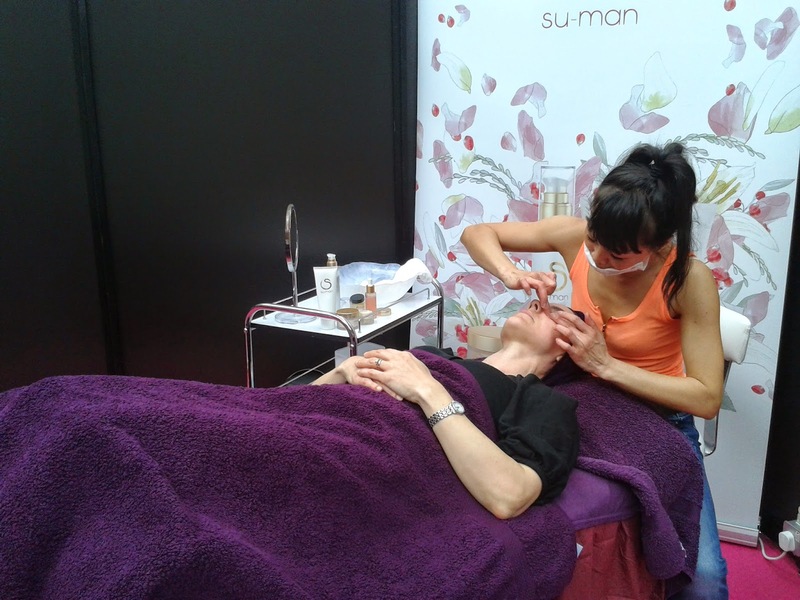 Su-Man is a leading celebrity facialist whose ‘magic hands’ have attracted many A-list clients over the years, including Juliette Binoche (to whom she was the personal facialist for 5 years), Joely Richardson and Freida Pinto. Su-Man’s Skin Reborn Sculpting Facial is renowned, dubbed by clients and beauty editors alike as ‘the facelift in an hour’ and ‘the natural alternative to Botox’. It uses Su-Man’s own specially created skincare (now available to buy here) and unique massage techniques, inspired by her background as a trained dancer, a Shiatsu Master and Pilates practitioner - talented woman! I arrived at the stand at the allotted time, and was greeted by Su-Man’s charming husband, Farooq, a successful dance producer – they met as dancers. I was then introduced to Su-Man herself, a beautiful petite woman with the most perfect complexion I think I have ever seen. As if that wasn’t enough to inspire, she also has the most incredibly toned physique. It simply is impossible to believe that Su-Man is 51 years old! Don’t just take my word for it, check out my photos. I climbed on to the massage bed and Su-Man tucked my hair back in a band. Then began my 20 minute express facial. Let me tell you now that from beginning to end this was a facial like no other I had ever experienced before – even in this express form. Yes there was cleansing, toning, and moisturising but it was so much more than that. Each stage of the facial had its own blend of massage. To cleanse Su-Man used her Purifying Cleansing Gel Oil and worked it into my skin employing the most incredible finger strokes - firm yet at the same time feather light. Her Rehydrating Toning Essence (with hyaluronic acid, rose petal, green tea and honey) came next and was tapped into my skin. Su-Man’s Velvet Skin Brightening Serum followed (note, before an eye cream! ), then her Awakening Eye Uplift, which she applied by zig- zagging her fingers over my eye area to really get inside those creases – Su-Man likened the technique to ironing a sheet! Su-Man also treated me to an application of her yet-to-launch lip balm, which contains two peptides to plump and treat lips. It’s due to launch in October – jot down the date, it’s gorgeous! I really didn’t want the 20 minutes to end. But they did and after I rolled off the massage table I looked at my face in a mirror. My skin looked amazing – re-energised, glowing, nourished. But it wasn’t just about my face. My whole body felt different, lifted, as if I truly was walking on air. This taster experience left me wanting more. So no surprise that I left Su-Man’s stand having purchased her Essential Discovery Collection for the special show price of £42 (normally £50), containing 40ml cleanser, 15ml serum and 40ml Exfoliating Facial Polish (not used in the express facial because of the mess). My mum, who I had dragged along to the show with me (I say dragged, she actually came skipping) also bought one and we both decided, THAT IS IT, let’s treat ourselves to the full monty, a one-hour Su-Man facial. Best start saving as they cost £120. But meantime, every one of us can now enjoy some of Su-Man’s unique massage techniques, for she has just launched ‘Su-Man’s Two-Minute Self-Facial’ on her website. You can check it out here. This sounds like such a fun experience, its so nice to take a little tie out to relax and the full facial sounds amazing. Wow. She does look amazing, and so does the facial. Would love to experience this! Great to be spoilt! I could do with a bit of pampering AND some anti-aging. Sounds like a lovely experience!